Alumnus Jack Lane graduated Russell Group university Cardiff University with a first class honours in Philosophy. Whilst studying at All Saints' Academy Sixth Form studied Philosophy and Ethics (B), English Literature (B) and Mathematics (D). We caught up with Jack to congratulate him on his brilliant results! 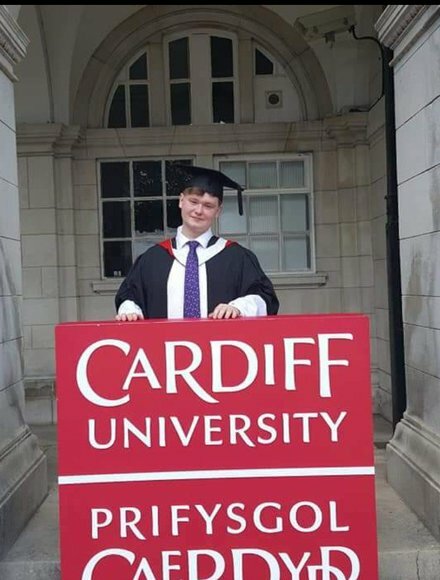 Other than getting a first in my degree I would have to say it would be presenting my dissertation on the philosophy of mathematics at a conference and the success I achieved as president of the Cardiff University Liberal Democrats. What did you enjoy most about your course at the Cardiff University? I really enjoyed the academic environment at my university. I was always encouraged to contribute and attend conferences and seminars held by the department. This not only encouraged me to work even harder but also allowed me to engage with philosophy even more. Make sure you have a good work ethic, focus is everything. More importantly, study things you actually enjoy that way you can maximise your university experience. I was always encouraged and I was told to aim high by my teachers. This positive and supportive outlook helped me to flourish. My work ethic and attitude was mostly positive because of this and the help I received helped me develop academically. As of this September I will be going on to Bristol University's philosophy masters program (MA) this will then allow me to go further and hopefully get onto a PhD course and hopefully after years of research I will become a lecturer.